Maurizio Baruffi is Chief of Staff for the Mayor of Milan, the host city for Expo 2015 which opens on May 1. MILAN, Apr 28 2015 (IPS) - How can we provide healthy food for everyone, without threatening the survival of our planet? This is the fundamental issue at the centre of Expo 2015 – which has ‘Feeding the Planet, Energy for Life’ as its central theme – and a huge challenge for cities. More than 50 percent of the world’s population currently lives in urban areas – a proportion that is projected to increase to 66 percent by 2050 – and ensuring the right to food for all citizens, especially the urban poor, is key to promoting sustainable and equitable development. As the city hosting Expo 2015, Milan has great visibility and an extraordinary political opportunity for working to build more resilient urban food systems. This is a vision that the City of Milan has decided to fulfil by formulating its own Food Policy, and by bringing together as many cities as possible to subscribe to an Urban Food Policy Pact: a global engagement to “feed cities” in a more just and sustainable way. The food policy, which will be implemented by Milan’s city government over the next five years, is being drafted through a wide participatory process, starting with an assessment of the strengths and weaknesses of the city’s food system. This is a complex picture with some bright spots and some shadows highlighting several thematic areas that the food policy should take into consideration: from access to food to the environmental and social impact of food production and distribution, from food waste to education. Milan has more than 1.3 million inhabitants, but almost two million people come to the city every day for work, study, leisure or, health care. Through its public catering company Milano Ristorazione, the City of Milan prepares and delivers more than 80,000 meals each day for schools, retirement homes and reception centres. Thus, there is a lot the City can do to enhance and spread good practices – for example, by tackling food waste and improving the sustainability of the food supply chain. Many projects are already in place. More than one-third of the fruit and vegetables served by Milano Ristorazione is organic, 57 percent is supplied from short distance, and children at school are encouraged to take home a doggie bag with leftovers of non-perishable food. 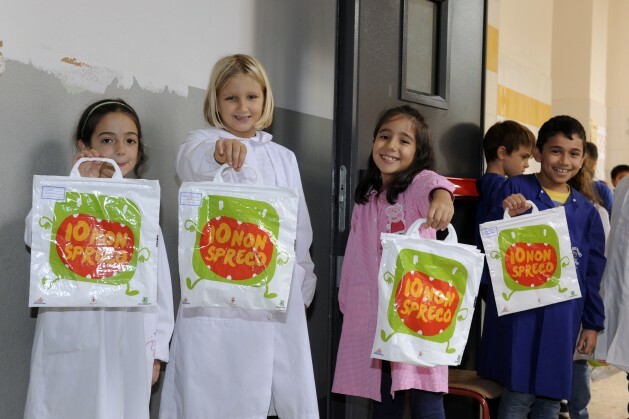 Every year, families in Milan still waste the equivalent of one month of food consumption, but several non-profit organisations are saving the food surplus from supermarkets and cafeterias and delivering it to more than one hundred of the city’s charities. Meanwhile, with poverty on the rise as a result of the prolonged economic crisis, civil society and public institutions are working actively to help those in need. Soup kitchens offer around two million meals each year and the City of Milan itself delivers almost 250,000 meals to the elderly and the disabled. The Office of the Mayor is currently asking citizens, civil society organisations, scholars, innovative entrepreneurs and chefs, among others, to have their say on the issues that the city’s food policy should address. The purpose is to draw up a strategic document that will be discussed in a town meeting in May, when a number of planning panels (Food Malls) will be launched. Their task is to turn the guidelines into pilot projects. The process will culminate in the adoption of the food policy by the City of Milan and the launch of a number of pilot projects that will address some of the issues outlined in the food policy over coming years. In the meantime, progress on the Urban Food Policy Pact is proceeding swiftly. The idea of an international protocol on local food policies was launched in February 2014 by the mayor of Milan, Giuliano Pisapia, at the summit of the C40 (Cities Climate Leadership Group) in Johannesburg. A few months later, Milan and more than 30 cities around the world started to discuss the Pact, exchanging data, goals and best practices through webinars carried out under the Food Smart Cities for Development project financed by the EU Commission-DEAR (Development, Education, Awareness Raising) programme. It is thrilling to see very different urban areas such as New York, São Paulo, Ghent, Daegu, Abidjan and Melbourne sharing projects, ideas, problems and solutions with a common goal: to build a network of cities willing to work together to transform their future, placing the issue of food high on the political agenda. A group of international experts is currently working on a draft of the Pact’s protocol that will be submitted to an advisory council and cities. The task of the advisory council – which is made up of international organisations, such as the Food and Agriculture Organisation (FAO), World Health Organisation (WHO), World Food Programme (WFP) and the European Commission – is to review the pact and ensure that it is consistent with other international initiatives on the similar subjects. Many cities have expressed their interest in subscribing to the Urban Food Policy Pact – to be signed in October this year on the occasion of World Food Day – and its proponents expect it to be one of the most significant legacies of Expo 2015. Looking forward, the Pact will also feature at the U.N. Climate Change Conference to be held in Paris in December. Agriculture and food production are major contributors to greenhouse gas emissions, and our ability to produce food will be highly affected by climate change – building a more resilient world, where the right to food is ensured for everyone, is a process that need to start from cities, and from their ability to develop sustainable policies.